Sara Mooser (right in photo) and Michele Lewis got the idea of applying to open a Fit4Mom franchise on the mid-Peninsula about the same time. Four years ago, the two joined forces as partners. They’ll be bringing the mom-tailored fitness programs to Menlo Park later this month with a grand opening, family fun day at Menlo Swim and Sport in Burgess Park on January 30th. “It wouldn’t have been as much fun if we’d done it separately,” said Michele. Another program is Body Back, which is an eight-week, result-oriented program that incorporates both exercise and diet. They’re giving this class at Menlo Pilates and Yoga and Holbrook Palmer Park. 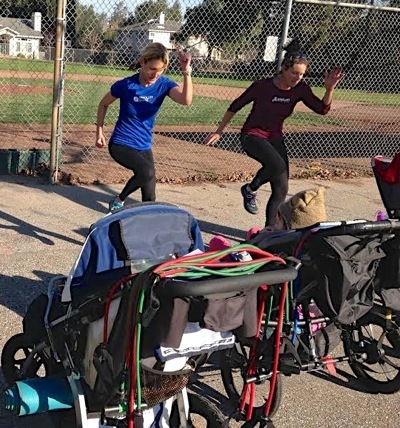 Before working with moms, Sara coached middle and high school students to run the Los Angeles Marathon through an organization called Students Run LA. She also coached two swim teams — a high school team and an agegroup team. Growing up, Michele was encouraged by her mother to be a “Jill” of all trades, and she competed in swimming, tennis, softball, track, ice skating, soccer, and volleyball to name a few. She competed in the Junior Olympics in Synchronized Swimming and played Varsity Tennis. Information about all of their offerings can be found online at Fit4Mom Midpeninsula.